10mm Ocean Polyester "OP" from Teufelberger with Factory Sewn Eye at each end. 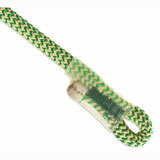 These assemblies are constucted from the Tan & Red striped "OP" cord from Teufelberger. Ocean Polyester is Teufelberger's response to the high demands made of hitch cords. Composed of a polyester/aramid sheath and a polyester core, its construction makes the rope highly abrasion resistant, grippy, and heat resistant. The second generation of Ocean Polyester was made softer in order to facilitate difficult knotting applications. Boasting a long servicelife, Ocean Polyester is great value for money.